UP Records presents something fresh for your ears! 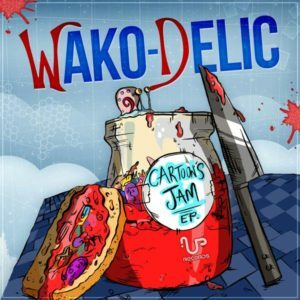 Wako-Delic return with their new release, Cartoons Jam, a mix of fantasy and reality in full-on melodic psytrance form. Wako-Delic consists of experienced producers Alon Amir (AKA Agwa from Israel) and Daniel Mor (AKA Sini from Austria). Here they boast an extraordinary journey of advanced synthesis and epic production, each track telling a unique story to take you on a trip directly into your imagination, with the classic special touch of Wako-Delic. Don’t hesitate to check out their previous 2015 release with UP Records, Harmonical Madness. So make sure to fasten your seatbelt, it’s going to be a bumpy ride! Mastered by Yam Eli aka Brain-Attack. MP3 Download | FLAC Download | WAV Download · Download count: 12,021. Wow , this release is so refreshing , new style awesome one ! Big up ektoplazm thanks for that one. Wako-delic are the next thing for sure. Thanks for that release you nailed it guys. 5* fresh and unique release is the best ! hey dude..the mp3 zip file downloads till about 20mb then it bombs out…it says unexpected end of archive. love what you have done here! big ups!